International criminal justice has had its share of bizarre moments. We’ve seen seemingly untouchable indictees turn themselves in to foreign embassies and request to be sent to The Hague. We’ve seen enemy indictees unite to win elections. We’ve seen indictees try anything and everything to get the International Criminal Court (ICC) off their backs. 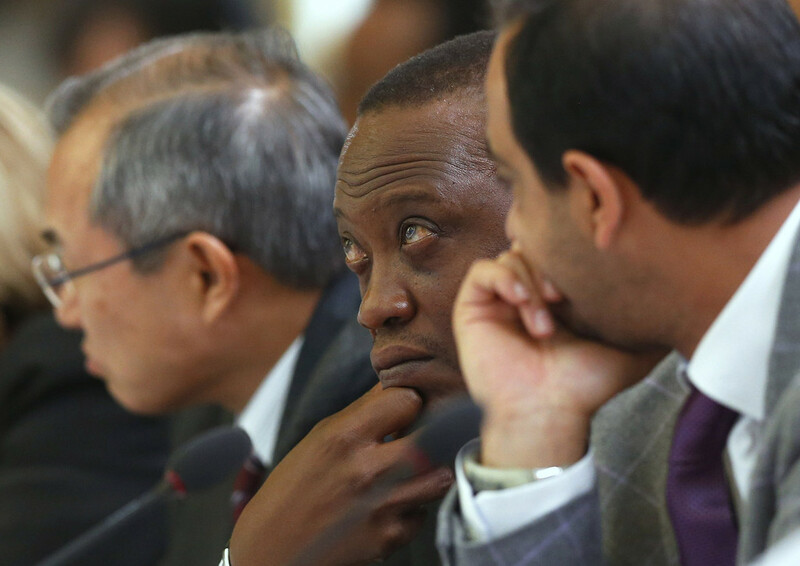 Until last week that is, when Kenyan President Uhuru Kenyatta took it to another level altogether. …In this regard, even the signatories of the Rome Statute have recently expressed concerns on that Court. I may recall the note verbale dated Thursday 2 May 2013 addressed by the Kenya Mission to the Security Council, containing a compelling case against the methods of work of the Office of the Prosecutor, on the Kenyan cases. This was also pointed out by a judge of the ICC, who recently resigned. In that respect, Rwanda hopes that the Security Council will soon table this issue, raised by a UN member state, on its programme of work, with a view to addressing the growing concern of member states, including signatories of the Rome Statute. …On the basis of the Permanent Representative of Rwanda’s statement I must surmise that the information contained in Kenya’s letter to this Council is unfounded and incorrect. It is a backdoor attempt to politicize the judicial processes of the Court. The letter referred to by the Permanent Representative of Rwanda has not been transmitted to us. We therefore reserve our right to respond to it in detail in due course and we hope we will be given that opportunity once it has been transmitted to us. This delegation wishes to reiterate that we are not in any way interfering with the conduct of the cases before the Court. To the contrary the Government of Kenya will continue cooperating with the Court and being a State Party to the Rome Statute [and] is cognizant of the obligations placed on it. But the bizarreness didn’t stop there. As the story grew, both Ruto and Kenyan Attorney General Githu Muiga both disowned the letter (see also Kevin Heller’s analysis here), perhaps because of how misplaced a move it really was. An indictee like Mr Kenyatta can’t sit in judgment of himself. The equivalent would be throwing open the doors to Kenya’s police holding centres and letting all suspects go scot-free. At the same time, there are few worse options for bringing such a letter to the attention of the Security Council than Gasana. As a non-member state of the ICC that has been very vocal about the Court’s bias against Africa, Rwanda’s support for international criminal justice – and the ICC in particular – has been precarious at best. Just a few short weeks ago, Rwanda worked feverishly – and sadly succeeded – in preventing any mention of the importance of the ICC for issues of peace and security in Africa. So what does all of this mean for the ICC? While Bensouda probably responded too quickly and defensively in going after Gasana, it is also true that anything that makes Kenyatta look desperate and foolish makes the Court look good. And after the controversial resignation of a Judge in the Kenya cases, meetings between Kenyatta and UK PM David Cameron in London, and amidst increasing evidence that the Court is losing the ‘perception game’ in Kenya, the Prosecution could use some good news. This entry was posted in International Criminal Court (ICC), Justice, Kenya, Kenya and the ICC, UN Security Council and tagged Uhuru Kenyatta, William Ruto. Bookmark the permalink. Has it occurred to you that Kenyatta indeed did not endorse that letter and that the Ambassador did it without consultation and/or authorisation, in a misplaced and desperate bid to demonstrate his zeal and support for Uhuru just to protect his job, and since it is not Kenyatta who appointed him in the first place but the previous President? It is on record among knowledgeable Kenyans that Kibaki and fellows around him like the UN Ambassador were not really comfortable with Uhuru as his successor and preferred someone else sponsored by what Kenyans called ‘State house dark forces’. Those knowledgeable Kenyans do not include the politically ignorant and highly partisan Makau Mutua whose previous hate filled predictions, every one of them, that Uhuru would never ascend to the Presidency, came a cropper. It is strange and laughable to us how you can then consider his flaccid opinion as authoritative when in fact it is as worthless as a bucket of warm spit. Uhuru or Ruto do not need to have their cases terminated by the UN and would much rather they go to trial and prove their innocence there so as to shame the devil that is behind their ICC travails. Most objective Kenyans know that those trials were politically instigated by the West and Ocampo in cahoots with their local water carriers like Makau Mutua, and where they never did any investigations before making their charges, hence the shoddy prosecution to date and Bensouda’s precarious case where 85% of her so called evidence was collated POST confirmation, and even as witnesses are jumping out of her case like rats. No wonder Judge Christine Van Den Wyngaert resigned from the case citing the ineptness of the prosecution case. Thanks for the comment. I appreciate your perspective. Is there any evidence that this was, in fact, a rogue UN ambassador? And, if so, will be be fired for making such a dramatic move without the approval of Kenyatta? For you to understand exactly what is going on, i would have write a long essay. However, what i can tell you is not to expect this guy to last long. He already has a lot of past baggage where he has antagonistic relations with his juniors/workmates. Also there are questions over his work ethic with allegations of corruption, which many people around Kibaki engaged in by taking advantage of the old man who was suffering illness that led him to be unfocused, to put it mildly. In any case, there is going to be a complete overhaul of the diplomatic service in the next two months. The guy is still at it, so we can no longer dismiss him as some “rogue diplomat” who will soon be shown at the door. (See Daily Nation “Opinion” , 21 May 2013.) After the “denials” by Ruto and Muigai, but total silence from Uhuru, for this guy to still be at it, instead of getting fired, leads to just one conclusion: 1+1 = ? Uhuru’s plan seems to be that he will continue to mumble about “cooperation” while his minions attack the court. Just what this is actually expected to achieve at the ICC is not clear. 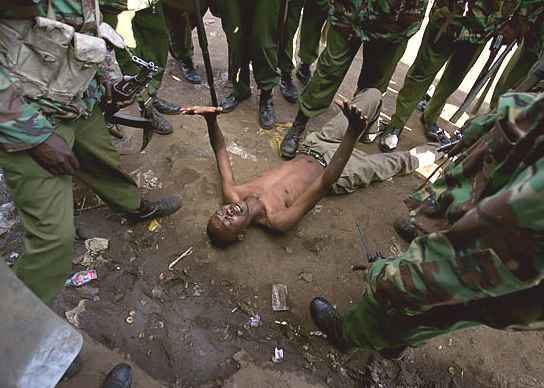 Much of this may be targeted at the Kenyan people, by way of preparing them for the non-cooperation with the ICC. That too is misguided business. All in all, I don’t see any of this really achieving anything, and, Mark has indicated above, it just makes Uhuru look desperate and foolish. No doubt he is desperate, and desperation can lead to foolish actions. Mark: That was a very nice write-up. I look forward to reading more from you. On one hand, OTP has now formally asked the court to issue an admonishment (rebuke) under article 87 (3) to chastise the Government of Kenya for its continuous leaking of confidential information to the accused (they have done that before, and OTP was smart enough to restrict its output, so it isn’t new). On the other hand, OTP threatens an article 87 (7) application. That one is edgy and can too easily result in a fracas damaging the standing of the court itself, which is why they only wave this stick in the air. The GoK has itself tried in the past – so far with little success – to whip up support not just within the African Union, but also in the assembly of state parties, and the strong stance both of Christian Wenaweser and now of Tina Intelmann against such machinations, does not mean that the Kenyan schemings could not find some facile followers. This is quite heavyweight, and can result in arrest warrants against the accused, either public or sealed; because it is also a violation of the summons conditions, as OTP had pointed out already in February. Article 70 (1) (b) (c) weighs heavily and at least Karim Khan knows that, which explains his grovelling and sollicitous tone on behalf of his freshly acquired new client in the last couple of days. Alexander – thanks very much for these insights, it’s very much appreciated! Western perspectives on realities on the ground are not necessarily always correct. However one does not need to look far to see contradictions or omissions in some of the comments made above not withstanding the subtle adoption of the presumption of guilt before being proven innocent. Re: Snoop: The ambassador was appointed by the previous administration of recently retired President Kibaki. In January 2013 prior to the elections, parliament (the equivalent of the US congress) recommended the Ambassador’s removal from his post as matter of national interest: http://www.nation.co.ke/News/politics/MPs-want-Kenyan-envoy-to-UN-recalled-/-/1064/1661508/-/aydl5e/-/index.html Kenyatta’s government has only just concluded the appointment of the cabinet, next to be appointed will be the ambassadors and high commissioners, the foreign secretary having been appointed on May 20 – http://www.capitalfm.co.ke/news/2013/05/kenyas-foreign-secretary-sworn-into-office The Daily Nation of May 21 notes “Once the President has forwarded the names of the principal secretaries to Parliament, he will proceed to nominate ambassadors.” Contradictions between Presidents and Ambassadors are hardly new or unique to Kenya, US Assistant Secretary of State (a much higher position than an ambassador) Johnny Carson who interestingly ‘retired’ immediately after the Kenyan election warned Kenyans of consequences, http://www.voanews.com/content/us-official-says-kenya-elections-have-consequences/1599063.html this was after President Obama had given a message that it was up to the Kenyan people to elect leaders of their choice http://www.youtube.com/watch?v=fgmVLJXS2x4 Wikipedia does note: “He resigned in 2013 following some comments on the Kenyan elections that differed from Obama’s stance.” The fact that was this was a key reason for his resignation is underscored by this signed joint statement from the United States and Western ambassadors to Kenya further contradicting Carson’s comments: http://elections.nation.co.ke/Blogs/Kenyas-partners-working-to-support-polls/-/1632026/1698778/-/icvys1/-/index.html yet Carson resigned more than a month after his comments. The current UN ambassador has already been admonished by the immediate prior parliament, it is unnecessary for President Kenyatta to take additional action when the action he will take is already public knowledge and that will be the appointment to or reshuffling of diplomatic posts. So he will be no doubt be replaced but nonetheless he has been given the opportunity by the Security Council to expound on his letter. When the UN ambassador is replaced, it is doubtful that the naysayers will stop at their pronouncement of guilt before trial at every turn and opportunity. Indeed does the definition of international justice change when the potential accused persons are westerners by origin? First of all, you have missed my point with regard to the ambassador. Let me be brief: It is quite clear, given his persistence, that he is not a “rogue” ambassador. Even if new emissaries are still to be appointed, Uhuru would not simply let the current ones run riot; he obviously has Uhuru’s blessings and even orders. By the way how has the immediate prior parliament (ended early March) admonished the ambassador for his antics of this month? Snowball’s chance in hell: this request will go absolutely nowhere. That one needs no further discussion. If you want to believe that it has a chance, then by all means indulge yourself; but that will not change reality. Yes, a request was made several months ago that the trial be held in Arusha or Nairobi. That one too has a snowball’s chance in hell. Again, no need to argue or discuss that one, but feel free to indulge yourself. Mass withdrawal of Africa countries: Again? A couple of years ago, most Jean Ping assured us that it would happen if the Kenyan cases were not deferred. How man countries actually withdrew then? “Indirect co-perpetration”: You seem to be going just by the media’s reporting of the opinion of one judge. I’m afraid that won’t save the Kenyan three. In any case, you may also note the prosecutor’s submissions regarding re-characterization. Recanting witnesses and all that: Article 70 proceedings and still going on. Please be patient. By the way, on the often repeated comment about ICC cases being all African: most people making such comments conveniently overlook that they were mostly taken there by Africans! In sum: (a) the cases will not be terminated or even deferred; (b) the useless body known as the AU will make its usual noise, but that will not have the slightest effect on reality; (c) there will be no trials in Arusha or Kenya; (d) there will be no mass withdrawal of African countries from the ICC. P. S.: Please don’t assume that I am “Western”. The ability of an ambassador to act independently and in the public interest is well enshrined in Kenyan law. Rather than rehash what has been stated elsewhere, I’ll suggest that you read what is posted in the comments here http://opiniojuris.org/2013/05/11/an-unusual-dissenter-from-kenyas-bid-to-shut-down-the-icc by Rob Clarke @ 5:57pm and look into recent court rulings on what constitutes public interest in Kenya prior to making the brash conclusion that the ambassador received an order from the current President to act. Even if he did, there is nothing criminal or illegal about discussing or exposing the underhanded and potentially corrupt workings of the OTP before the assembly of nations in the public interest of over 40 million Kenyans. The Kenyan Parliament has the duty to admonish the conduct of an ambassador but it is not there to engage in the witch hunt of public servants acting in the public interest until it is proven so otherwise. The President and Parliament have more important things to do for the Kenyan electorate the elected them than chase after a civil servant whose tenure is just about over and who as per his own declaration is engaged in a public interest activity. There have been no demonstrations or public outcry about the letter from a broad cross section of Kenyan society to demand the ambassador’s immediate removal. Kenyans are part of the human race and the UNSC is just one place and venue to hold the OTP and ICC accountable, politically or otherwise. Kenya is an independent state and equal member of the United Nations, with independent laws and a constitution unbeholden to western neocons. There is indeed no need to engage in assumptions, Africans are not in the habit of trashing their institutions and rubbishing what is plain and obvious to lay persons. The arguments you make are rehashed over and over by western actors, agents and their proxies i.e. civil “evil” society http://www.nation.co.ke/oped/Opinion/-/440808/1723738/-/k4r1buz/-/index.html, who are out of touch with the realities on the ground, do not have first hand knowledge of what happened in 2007/2008 and rely on unreliable reports prepared by proxies who receive western taxpayer funding http://i1151.photobucket.com/albums/o640/ZoukSu/29008_10201099099428026_1959510018_n.jpg to engage in destabilization of democracies that do not obediently tow the line to meet the west’s selfish interests. The OTP has not denied that the witnesses who have recanted and sworn statements implicating the OTP in some cases were OTP witnesses, so what gives? One must go by plain and simple unfabricated facts unless and until you have other competing self evident factors. Anything else unsupported by plain fact in the face of collapsing cases must be seen as an vain attempt to prop up what is essentially on life support save the time needed to go through a lengthy and unnecessary trial. It is already clear that the confirmation of charges was accomplished on the basis of falsified evidence. Multiple disparate witnesses cannot all be consistent in that they were induced with promises of a better life by the OTP and their proxies to falsely implicate the indictees. reputation. Her work in international organisations has been first class. to work together on our mutual interests with renewed vigour. Just today South Sudan, the world’s youngest nation declared it would never join the ICC and it is rather interesting you called diplomacy and political approaches futile? Call it what you choose but the ICC looses either way either at trial, in terms of membership or in its ability to conduct its operations. The AU will no doubt pass a resolution this weekend in regards to the ICC. The Kenyan UN Ambassador this afternoon addressed the full 15 member UNSC. The ICC and the UNSC can naturally elect to ignore but when the eventual consequences come to bear, the so called “useless” body will simply move on to the next step. The way the world works is changing, it is no longer the status quo favoured by Western neocolonialism. It is realities and concrete actions in this regard that matter. All your arguments aside, the prosecutor has little to no chance of a conviction beyond a reasonable doubt. If you’re not Kenyan and base your conclusions on what the OTP, Michaela Wrong, Jefferey Gentleman of the NY Times and other “expert” westerners write from remote locations outside Kenya, while glossing over the simplest of hard facts on what actually happened, then your perceptions are well…. understandable. South Sudan is backing Kenya? Wow. That will make the world sit up and listen. (By the way, where *is* South Sudan). * In 2009, we were told that African countries would leave the ICC is the cases against Bashir were not deferred. None has left and some have joined. * In 2011, we were told the same thing if the Kenyan cases were not deferred. Mr. Ping was especially noisy about that. What happened? * In 2011, the Ivory Coast sent Gbagbo off to the Hague. Did you hear of any African countries complaining about that? * In 2012, Mali asked the court to open an investigation in that country. Have you heard any African countries complaining about that? But you will hear people wail, “oh in just two years the ICC has targeted two more African countries”. After they resolve, everyone will go home, and the ICC cases will continue, as they have despite the finest sounding resolutions from the AU. As for the ICC letter, see my point (a) above: ” the cases will not be terminated or even deferred”. That foolish mission was dead-on-arrival, but the death was very firmly confirmed yesterday. Now, pay attention to (b) — (d). — “Africans are not in the habit of trashing their institutions and rubbishing what is plain and obvious to lay persons”. I got a good laugh out of this one. What made it even funnier is that you probably believe it! As I write this, I note that the what the extent to which the USA funds our health system far exceeds what GoK puts into it, that our food security is now in the hands of the US government’s Feed The Future program (I’m sure you know all those droughts and famines that we never prepare for, and which always leave thousands dead and the country begging for food), ….it would take too long to just exhaust the USA. Independent and equal! But back to the ICC … did you read GoK’s Admissibility challenge of two years ago? The one in which they stated they were investigating thousands of cases and in which they gave a timeline according to which they would start prosecuting in Sep 2011? Have they dealt with even 10 people? By the way, it’s good to have this guy on the bench and Bensouda in the OTP. They know the African mind, so there will be no pulling fast ones past them. African countries need to stop blaming the world (i.e. the West) for their state of affairs and start taking care of their own sh!t. That is the only way to move forward. So, you will have a hard time selling me the all the standard b.s. that it’s just the colonialism and neo-colonialism and imperialism and whatever *ism is currently in vogue. P.S. Feel free to get back to me on the TJRC report. Judge Wyngaert’s concurring opinion on Indirect Co-perpetration is plain and clear, media interpretation notwithstanding http://www.icc-cpi.int/iccdocs/doc/doc1529537.pdf Was Mr. Chui not charged as an indirect co-perpetrator and acquitted by a panel of judges, among the reasons for acquittal being the inapplicability of indirect co-perpetration under the Rome statute? This is not a reference to the most recent damning opinion against the OTP in the Kenyatta case but a case that has since been decided by a panel of judges, among them Judge Wyngaert. Considering Chui was not ordered held pending Appeal, it is likely the judgement will be upheld. An additional note on Parliament, did you read what Parliament recommended? It is moot to keep admonishing an individual when the individual has already been recommended for removal during the lifetime of the immediate prior administration that the civil servant belonged to. As noted above, Kenya’s Parliament has more pressing business to attend to on behalf of Kenyans not rubber stamp the wish list agenda of the OTP, bloggers and vested Western interests. Only a Kangaroo court needs to constantly adjust the prosecutions claims at an advanced stage so as to “fix” the indicted through any means necessary. One can safely surmise that had Dominique Strauss-Kahn been an ICC indictee, any deception by the complainant and main witness would have been simply glossed over with the prosecution being given much leeway to ‘recruit’ new witnesses, presumably coached to support the original lie. On the cases being taken there by Africans, well you see, Africans are not as gullible as you make them out to be. When over 200 submissions on the illegal Iraq war that cost over several hundred thousand lives were made, the Prosecutor declined to open an investigation on what were obviously the court’s greatest paymasters. Do you for one minute think that Israel, the UK or the US will ever be referred to the ICC by the security council even in the face of UN investigative findings? The ideals that African countries subscribed to for equal administration of justice without fear or favour when they signed up to the ICC are non-existent! The wheels of Justice at the ICC seemingly only turn when indictees are Africans not the other way around. The below statement by Donald Rumsfeld best epitomizes some of the greatest complaints about the ICC. The US had the foresight to understand there was something seriously wrong with the ICC. What is wrong with Africans pointing out the same? The U.S. has a number of serious objections to the ICC — among them, the lack of adequate checks and balances on powers of the ICC prosecutors and judges; the dilution of the U.N. Security Council’s authority over international criminal prosecutions; and the lack of an effective mechanism to prevent politicized prosecutions of American servicemembers and officials. Well said Wilson, i couldn’t have put it better. When ICC fans respond to complaints of blatant bias against Africans, they never fail to point out that Africans signed on to the Rome Statute voluntarily. What they do not want to discuss is the obvious fact that Africans believed, very naively and unwisely in my view, that the ICC justice system would be applied equally and that it would live up to the idealistic desires of most Africans and others, of an equal world where justice is applied without discrimination. I never bought into that nonsense, precisely because the same European/western powers that were vocal supporters of and pushing for the establishment of the ICC never found it fit to accede to demands for African and Asian representation as permanent members of the UN security council, where real power lies, and the same power that created the ICC. Why should Africans then trust an institution where they have no power to change policy significantly, and when that power and representation is sought, the request is brusquely brushed aside as unnecessary? The critical problem now for the ICC and its supporters is that its credibility and moral high ground is rapidly diminishing fast amongst Africans as a result. Today, the AU heads of state summit will discuss future cooperation with the ICC as a top agenda, and the signs are not good. There is a Swahili saying that goes ‘mjinga akierevuka, mwerevu yu mashakani’.. literal meaning that…’when a fool finally wakes up, the clever person is in trouble’. The African ‘fool’ is finally waking up. (e) The AU will have *absolutely* no effect on the cases before the ICC. (a) That judge is just one judge in the court. Don’t get too excited on the basis of that single opinion. Yes, her opinion is clear. And so? (b) No, that was not the reason why Chui was acquitted. Read the entire decision. (c) Pay attention to this, because it has relevance to the cases faced by your hero, Uhuru: Chui and Katanga were jointly charged. The cases were then separated, Chui was let off the hook, but Katanga is still in the mire but facing a different mode of liability. Try to understand the OTP’s submissions on re-characterization. What you need to understand is that if the evidence is there, this court won’t let anyone off the hook simply on the basis of a technicality; this court is another world from Kibera Magistrate’s Court. If you wish to hang your hopes on such technicalities, then go for it! But the trials are still on. What is this? Saturday Night Live? Did you not see the MPigs demonstration the other day? Even before the MPigs started “work” their foremost concerns were “where’s my money?” and “where is the eating taking place”. And since they started work, it’s only downhill—threats to stop this and that unless their salaries and perks are increased. Pressing business. Ha! On behalf of Kenyans? He, he, he. Unwillingly and a bit unwittingly, “Tony Irungu” – who is like “Wilson” a mouthpiece for the GoK and the accused, in spite of the well-polished and unKenyan English displayed in the comments, which is much defter than the Attorney General’s own various briefs which were equally pompous and primitive – speaks the truth here. He speaks the truth in the following respect: African potentates had initially believed that the ICC might only be a convenient tool against warlords, renegades and rebels – and the first couple of cases indeed confirmed this glib hope. But when it became clear that they and their crimes themselves might be met with justice and unconniving impartiality, they became scared and more scared. This fretting started with the al-Bashir case, and the two main Kenyan cases are now seen not only by the Kenyan accused (who are identical with the state), but also by many other criminal African liidaahs and dictators, as worrisome and inquieting. “Who will be the next among us to be prosecuted for our crimes?” is the growing fear. The Kenyan accused, using the governmental stooges and media mouthpieces at their disposition, are increasingly realizing that their strictly legal and procedural chances are weak. They had deluded themselves for a long time about their chances in trial, thinking that filibustering and avalanches of dilatory briefs and applications would work before the ICC in the same way as they successfully worked and work to their advantage in their national courts. In parallel, they successfully proceeded to intimidate, threaten or bribe witnesses. – One is an intensification of lawfare through corrupt mainstream journalists, through bought fulltime PR bloggers and through a veritable onslaught in “social media” (very intensively since about 1 year; such pro-accused items are paid per posting and at times also per length and importance), plus pressure on editors (e.g. the CEO of the influential Nation Mediagroup Linus Gitahi received the purposeful douceur of his dear daughter being chosen to proudly ghostwrite the presidential address to the nation, of the co-accused Uhuru Kenyatta, a fact of media-accused collaboration that was prominently showcased and displayed in most national media). The heavy-handed Ugandan approach of president and meanwhile dictator Museveni is not needed for such purpose, because Kenyan media are sufficiently pliable and influence-prone. However, the accused have only _recently_ discovered the more scholarly niches of the Web’s comments sections – like this one and African Arguments – and are now trying to cover these as well. Propaganda, as I said. – The second prong is a renewed diplomatic offensive, before the United Nations (Security Council) and before the African Union. This thrust is not so much meant to “terminate” or abort these ongoing cases – that is legally impossible, and the accused’s own lawyers and even the GoK legal beagles slowly begin to realize that – but it is meant to undermine the support and the legitimacy of the ICC, and its ideals as a whole. 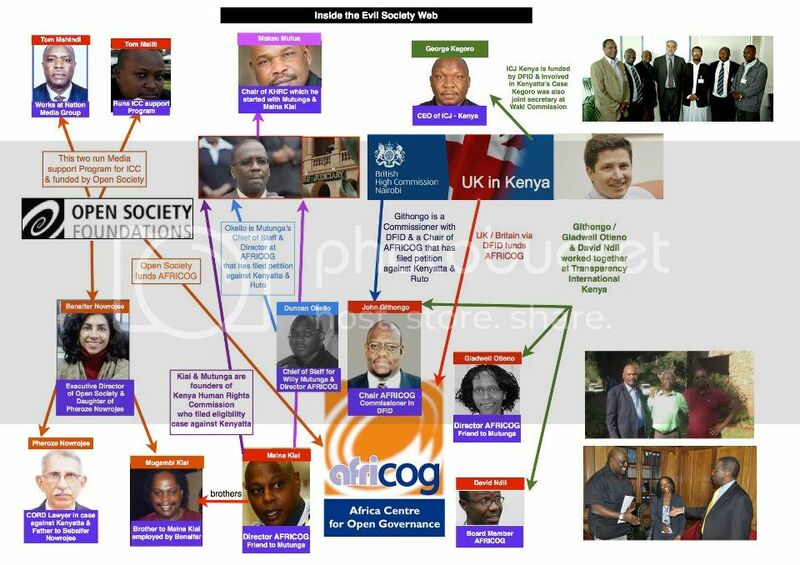 Their interest (so the Kenyan accused believe) is potentially shared by the potentates of many African states, and not alone African countries. This second attack is indeed directed against human rights and human rights enforcement in general, with the ICC only being a target of occasion. And very unsurprisingly, is accompanied by coordinated strong attacks and unprecedented threats and smear campaigns against NGOs, CSOs and human rights activists on the national level. Mr Alexander, yours is a typical NGOist ‘activist’ tactic – obfuscate and confuse issues with irrelevant manufactured stories such as above. I do not neither would i ever accept a Govt job, either as an employee or as a propagandist. To the contrary, i am self employed and what i say and write about is what i believe in my heart; that the deck is stacked against Africans right from the UN system that created the ICC, and no amount of uncle tomish obnoxiousness and excuses will change that. You start wrong, you end up with a wrong and bad product, and that is what happened with the ICC. Would you care to address the issues raised by Wilson and i instead i.e is the ICC fair to Africans or not, as compared to how it behaves in other parts of the world? Why is it that to this day, they have not cited Assad despite 90,000 civilians dead, and whose permission are they waiting for? They have not cited the Libyan rebels who deliberately massacred thousands of black African expatriates plus, shockingly, their own fellow black Libyan citizens during their war against the Gaddafi regime in a clear case of savage ethnic cleansing, and whose blowback is the Mali situation we now witness. 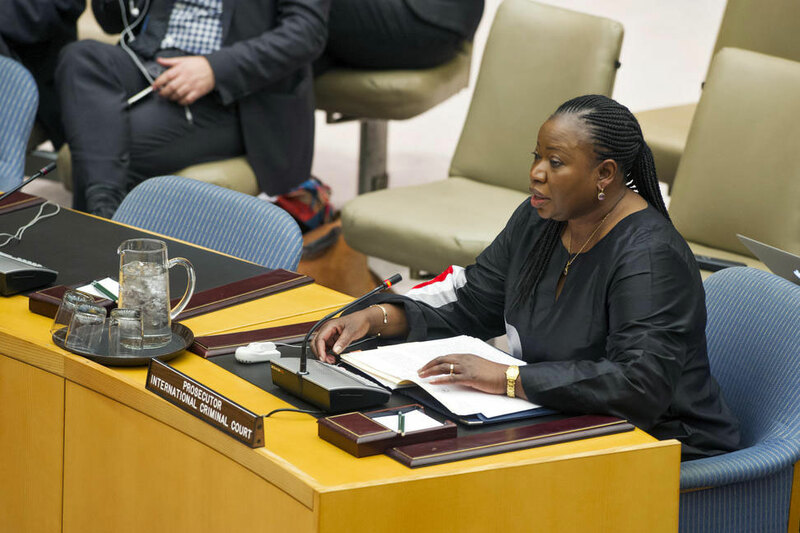 However, what does the exalted Madame Bensouda do? She opens a case on the ‘situation’ in Mali against the very people who fled Libyan extermination, WAY AFTER the situations in Libya and Syria started and have not even been resolved and no killers brought to justice!! Reason? Obviously, because these Malian Tuaregs want independence, but their region unfortunately possesses huge gas reserves that the West, Bensouda’s bosses, must have. Dishonest blind people like you…i pity. You have also chosen to overlook that the court has no jurisdiction in Syria and so Bensouda cannot simply get involved because she thinks she needs to. And you seem to be totally unaware that there are ongoing cases in relation to Libya. What was that about “dishonest blind people”? That, by the way, is not some imperialist NGO report. But back to the ICC … the commission is of the view that in some instances the military has committed crimes against humanity. That sounds like something for the ICC. Should we recall all those MPs who lustily shouted “let’s not be vague, let’s go to Hague”? I am astonished that you have chosen to peddle your stuff here when there are so many Kenyan “cyberforums” where it would be welcome and even cheered on as “deep thinking”. Be that as it may, here is a very plain fact: Africa has become a very costly (in every sense of the word) mess. It is costly to both Africans and the rest of the world. And it has been going on for far too long. At the heart of all that lies assorted monsters (some call them “leaders”) whose activities seem to be limited to robbing their citizens, on the one hand, and, on the other imagining the worst possible atrocities to visit upon them. Even for Africans it has all become a bit too much. In “crimes against humanity” the “humanity” is very important. Their “leaders” might not be, but most Africans are humans. Most of them would like to be rid of their monsters, regardless of whether other monsters in the rest of the world have been caught. No doubt there is some “eating” that has got you doing your bit. Fair enough; Kenya is all about “eating”. But try to not get carried away. Keep an eye on the “humanity”. If you are Kenyan, then start with the TJRC report: the gravest danger the average Kenyan faces (and has always faced) is from the government of Kenya. There’s a tale that goes beyond two individuals who, in any case, have described the ICC matter as a “*personal* challenge”. Those of us who are not “eating” or who have disposed of their tribal blinkers are overjoyed that finally there is a body like the ICC that has served notice: it will no longer be business as usual—“kazi iendelee”, as Kibaki says—for Africa’s monsters. And we will keep defending the ICC for every little opportunity it offers Africans to live a life of dignity, free from depraved “leaders”. Wow, Snoop! Seems like we really got your goat. You have responded with highly self serving ‘arguments’ to the same topic over a period of 2 hours writing bitter one liners, almost as if you have nothing else to do except to stew, steam and consult your afterthoughts about what Wilson and i wrote hours ago. Given your highly resentful reaction liberally spiced with a crude distortion of the ICC reality, i can say we are doing a good job exposing the hypocrisy and misguided fanaticism of ICC zealots and cultists like yourself. 1. The AU discussion about the Kenya cases is not about whether the cases will be dropped, they know that the ICC will not do that, simply because the ICC serves political purposes its sponsors are not ready to reconsider, yet. The AU is instead addressing the 1 billion people it represents so that it gets a sufficient mandate to eventually pull out of the ICC, an action that will have negative consequences on the ICC as an institution whether they continue with the cases or not. It is not for nothing that the ICC Presidency went to Addis Ababa in 2011 to lobby against pulling out when the topic was being discussed for the first time. When the time comes, Africa will pull out, be patient. The ICC can then go ahead to justify persecuting Africans to Europeans, but certainly not to Africans. 2. The court has no jurisdiction in Syria, but neither did it in Libya or Sudan, yet it has ongoing cases in those two nations. What gives? Maybe you need a new set of binoculars. 3. The TJRC report is a biased copy and paste report that never did any credible and independent investigations as they were required to do. They simply regurgitated past commission of inquiry reports like those from the highly partisan Kenya human rights commission, and then pocked here and there to retrieve what they needed to sanitise favoured politicians while demonising their political enemies. Don’t you find it curious that its chronology goes back to 1895 and includes the colonial era atrocities and war crimes by the British, yet it conveniently omits to account for the more recent 1982 coup attempt led by Raila Odinga and a cabal of Luo Air force officers, and where over 1,500 innocent Kenyan civilians died in Nairobi within one week..raped, mutilated and savaged by those ‘soldiers’. Just go to Parklands suburb where many Asian families live and ask around about the traumatic events they endured at the hands of those barbarians. Why did the TJRC omit that sad episode and don’t those Asians deserve truth, justice and reconciliation too? The only reference to the 1982 coup is where they indict Army officers for the torture and incarceration of suspected coup plotters from the Air force, but what about the people whose human rights were abused by the coup plotters? 4. It is a free world and I can ‘peddle my stuff’ anywhere, and this is Mark’s blog, not yours. I don’t recall him appointing you his gatekeeper or Alsatian. Do not patronise me about your concern for Africa; you are not the only one who knows or cares for Africa. Many of us do and that is why we abhor the interference of busybodies like the ICC and those like you who imagine they have a monopoly of knowledge about what suits Africa more than those who live and work here. You actually don’t know the reality because you probably don’t even live in Africa, and probably never will. Yes, people like you always get my goat. But I hope you have learned that is not one of those Kenyan cyberforums where your peddling of junk will go unchallenged. Interference? I didn’t hear any of that back in 2008 when Kenyans were busy slaughtering each other and begging the world to help. I didn’t hear it when Kenyan MPs were yelling “don’t be vague, go to Hague!”. I never hear it when at every drought we starve and beg the “international community” to “do something”. Etc. The ICC has finally cornered some of our monsters, and we should let them get sorted out. Noise like yours is very unhelpful in that regard. What you should focus on is choosing a nice, large-screen TV on which to watch the trials. We are now at the end of the year and Macharia Kamau is not only still at it but even more energetic in his pro-impunity activities.